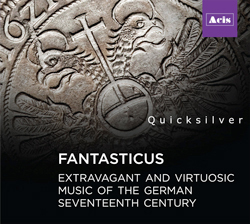 The New York-based period instrument ensemble Quicksilver, co-directed by violinists Robert Mealy and Cleveland’s own Julie Andrijeski, have released an enthralling album titled Fantasticus: extravagant and virtuosic music of the German seventeenth century. Full of brief sections “with abrupt transitions, passionate harmonies, and quirky dance rhythms,” these fantastical pieces can be beguilingly unruly, aping as they do the formal structure of a speech but with unexpected turns of topic and flashes of brilliance. The genre is probably best known to organists through Dietrich Buxtehude’s rangy Preludes with their contrasting sections of free improvisations and more organized fughettas. Harpsichordist Avi Stein gives a fine demonstration on the album in Buxtehude’s Präludium in g, BuxWV 163. Quicksilver brings a curious toolchest of instruments to selections by Buxtehude, Matthias Weckmann, Antonio Bertali, Johann Kaspar Kerll, Johann Schmetzer, Johannes Vierdanck, and Andreas Oswald. In addition to Mealy and Andrijeski, the band includes trombonist Greg Ingles, dulcian player Dominic Teresi, viola da gambist David Morris, harpsichordist and organist Avi Stein, and theorbist and guitarist Charles Weaver, who contribute many color possibilities to the ensemble. Lovers of Baroque music will enjoy hearing these dozen pieces that come from the wild early days before styles became more routinized and predictable. The very first selection, Sonata No. 9 by Hamburg composer Matthias Weckmann, will open your ears to something that may be new and strange — but addictive. Mealy and Andrijeski do some fancy fiddling here and elsewhere on the album, but their partners on trombone, dulcian, and continuo are equally impressive. The liner notes offer full bios of the performers and a detailed “instrumentarium” about the origins of their instruments. The disc, recorded at Drew University in New Jersey, is clear and intimate-sounding, with just enough ambient reverberation to give a nice bloom to the colorful instrumental timbres. Published on ClevelandClassical.com December 13, 2016.